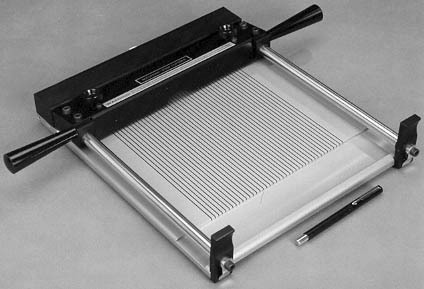 The Inotech Strip Cutter is a precision instrument which accurately cuts strips of nitrocellulose membranes used in nucleic acid and protein transfer procedures, including western blot immunoassays techniques. The absolute cutting uniformity of this devices maximizes membrane use and minimizes waste. Western blot immunoassays (based on the methods of Tsang, et al. 1983 and 1985) involve the electrophoretic transfer of antigens to a membrane (S&S NC nitrocellulose, BA83, 0.2 µm). The membrane is then cut into strips, each of which is exposed to a different sample (serum, antibody, etc.). The Inotech Strip Cutter maximizes efficient use of the membrane while dramatically reducing membrane cutting time. Inotech cutters are available with 2.5, 3, 4, or 5 mm strip cutting widths. Each of these modules can cut membrane sheets up to 20 x 25 cm in size. The prewet membrane sheet is placed on the device's cutting plate (it is recommended that transfer membranes be cut with a sheet of S&S Cutting Film for optimal cutting efficiency) and the cutting cassette drawn across it. The result is a series of uniform strips with a 1/2 inch uncut edge at the top for ease of handling. Individual strips can then be cut from the sheet directly over the channels of an incubation tray. Transfer media sheets are cut with a series of double-edged razor blades. When blades become dull with use, they can be rotated to one of three additional cutting orientations. Blade cassett should be returned to Inotech for blade replacement. Additional blade cassettes may be purchased to ensure uninterrupted use of cutter. Stainless Steel blades and anodized aluminium cutting plate resistant to most reagents. Comes complete with a strip numbering stamp, stamp pad and ink, cleaning brush and dust cover.